Wow! Where to start on this movie. First thing is that I went in with low expectations. Han Hyo Joo (from Shining Inheritance, Dong Yi and Il Jimae) is always very cute and happy, but I’ve never been overly impressed with her. Hero Jaejoong (of TVXQ or DBSK fame) is playing the male lead. I’ve never seen him act before and like many musicians turned actors, I had low expectations. But, I was more than pleasantly surprised by how much I enjoyed this film, due in part to some amazing supporting actors. This piece featured two of my absolute favorites. Shin Goo from ROYOW and Thank You was as usual – Amazing. The other was Kim Chang Won of White Tower, Il Jimae, Coffee Prince and Queen of Reversals. I love this actor, he just always does such a quality job and there is no shortage here in this piece. Though there were times I was lost with the story and things weren’t clear why or what was happening, but by the end you get it. I thought it was a very moving story and very beautifully shot. But (here it comes ladies) the most beautiful thing of all was Jae Joong. Yes, I’ve heard the hype about him, but other than the occasional MV, I really haven’t seen much on him. I knew he was good looking going into this, but really and no hate mail please, there are lots of idols I could definitely skip, no big deal. So Jae Joong was a pleasant surprise. Yes, he was a bit over coiffed for my taste but frankly I am beginning to understand that K taste run toward over coiffed men. He was a bit wooden at times, but also showed some really credible emotion at key plot points. Here’s the real kicker, I loved his voice, gorgeous, sandy, breathy voice. Okay, I admit it, I am now a Hero fan. Their kiss was not even super hot, but he looked so manly and comfortable kissing her, I couldn’t help but fall for him, I will be adding him to my Best K drama Kiss list posted on my Best of …. lists page. 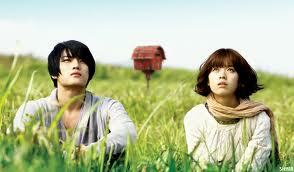 Overall this wasn’t ground breaking, but I did really like it and loved getting to know Jae Joong. Grade 8.5 out of 10. Mostly a lower grade because the story was a bit incohesive, but that might have been lost in translation. I am very curious to know what others thought of this drama, so kindly leave comments below. Thanks! Having seen Hero’s performance in Sunao ni Narenakute, I have to the give the boy props – he can act. He’s not the best yet, but he improves more and more and does have a way of conveying some great emotional scenes and I just like Han Hyo Joo. Coming into this film, I actually had somewhat higher expectations and was disappointed as it appeared totally random. Something you see often it seems. We’re thrown into the middle of a story and have know idea just what the heck is going on, but as it is pieced together and when we see the final man they duo help, it saves itself. Although, I was shocked that they actually went through with a happy ending as a lot of Asian films and dramas don’t care if you get the happily ever after couple (What Happened in Bali, Autumn Tale, Damo, etc).